NASA has unveiled plans for its next-generation, post-Shuttle spacecraft to carry humans into earth orbit and beyond. The state-of-the-art, four-astronaut capsule, called the Multi-Purpose Crew Vehicle or MPCV, builds on earlier designs for the Orion crew capsule. And the versatile new craft features an enhanced emphasis on crew safety. NASA Associate Administrator Douglas Cooke says it made sense to stick with Orion, a survivor of the recently-cancelled Constellation program that had aimed to return astronauts to the moon. “We’ve made a lot of progress on Orion. We have a ground test article that is a full structure with a lot of the systems actually installed into it for testing. So, it’s well down the road. It answers the requirements and represents a significant investment in that path at this point," he said. The Multi-Purpose Crew Vehicle being assembled and tested at Lockheed Martin's Vertical Testing Facility in Colorado. The Obama Administration cancelled the Constellation program in 2010 because it was behind schedule and over budget. Tariq Malik is managing editor of Space.com, an online newsletter. He says that while it could be used as a replacement for the retiring Space Shuttle fleet, that is not NASA’s intent. Rather, Malik says, the redesigned capsule is the space agency’s all-purpose vehicle for a variety of missions beyond earth’s orbit. “Visiting satellites if it’s needed. It’s going to have a spacewalk capability, which the original Orion capsule as it was prior to this announcement, would not have. And then they would be able to use it as the core vehicle, the transfer vehicle for deep space missions. You know you would attach a module or some other kind of addition on to it if they are going to be up in space for extended excursions, and then they use it as their truck," he said. The craft is designed for missions of 21 days. NASA’s Douglas Cooke says it will also be able to rendezvous with another, larger spaceship to continue its voyage to the Moon, Mars or beyond. “This vehicle would be just maintained in a more dormant mode, while the crew would be in another [spacecraft] which would have the longer term consumables and capabilities to support them," he said. The capsule would then be on-call to take astronauts back to earth. The craft is also many times safer than the space shuttle. Tarik Malik says the launch-abort system - rockets that would propel the capsule away from a malfunctioning launcher -- proved successful in tests last year in the Mojave Desert. “It was flawless. And so they know that it works and they can build that into their system for whatever they need in terms of the rocket as well," he said. While a lot of work remains to build an integrated system, including a rocket to launch the crew vehicle, Malik is encouraged that NASA and its aerospace industry partners are on the right course, with the goal of keeping America’s manned space program moving forward. “And they can use everything that they learned in the last five years in the previous program and re-purpose what they need to make that goal," he said. 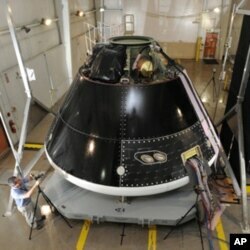 NASA hopes to launch the new craft into Earth orbit within the next five years.